Environmental conditions of the Baltic Sea’s (BS) ecosystem strongly depend on meteorological forcing over the area and adjacent NE Atlantic. It affects e.g. 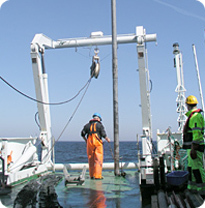 regional hydrography and saline water inflow from the North Sea into the BS. These changes are recorded in the BS sediments. We aim to identify forcing mechanisms of environmental changes of the BS, to differentiate natural variability and changing patterns due to man-made activity, by studying these sediment archives. In addition we will provide scenarios of the future development of the BS. The acronyme INFLOW arises from the project title "Holocene saline water inflow changes into the Baltic Sea, ecosystem responses and future scenarios". Produce model simulations for selected time slices back to 6000 years. Proxy reconstructions will be compared to results from model simulations. We will use these evaluated models to provide selected scenarios of impact of naturally and human induced climate change on the BS ecosystem at the end of the 21st century. INFLOW project is one of the BONUS research programme projects. INFLOW is funded by national funding agencies (Academy of Finland; Russian Foundation for Basic Research; Ministry of Science and Higher Education, Poland; Forschungszentrum Juelich Beteiligungsgesellsschaft; Danish Agency for Science, Technology and Innovation; Swedish Environmental Protection Agency; Swedish Research Council for Environment, Agricultural Sciences and Spatial Planning), the EU Commission and the participating organizations.